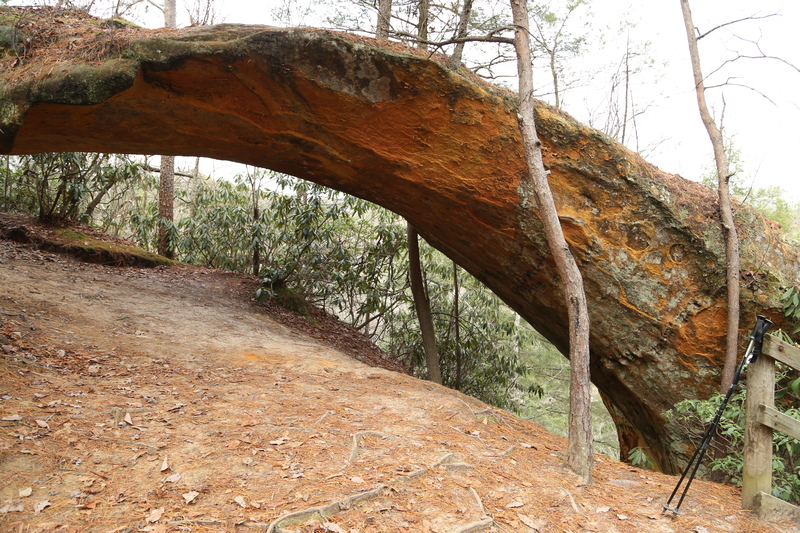 Red River Gorge boasts some of the most unique and rugged scenery in the region and is also home to over 100 natural rock arches from the small but still interesting, to the large and magnificent. 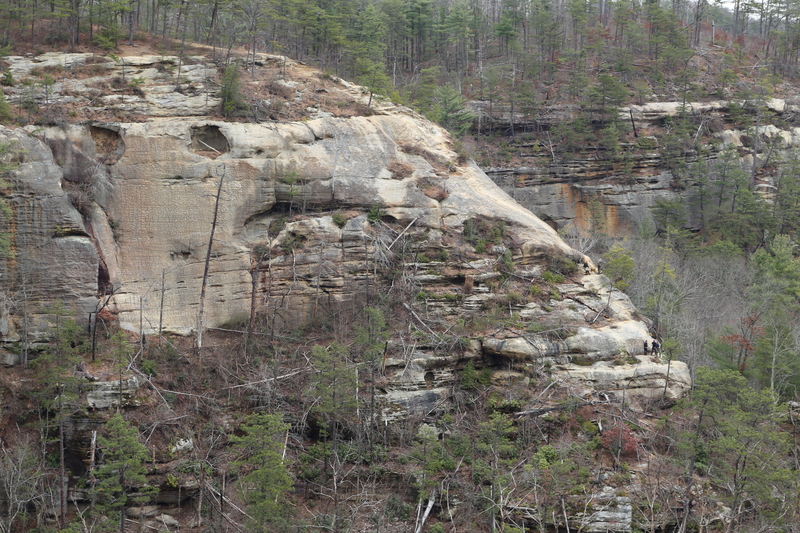 Spectacular views, like the header photo of Indian Staircase taken from across the valley, are common throughout the gorge. CAUTION: Sadly there are many who venture into amazing places like this dangerously unprepared for the challenges they will face and still others who are disrespectful of the environment and those around them. The route up Indian Staircase is extremely dangerous and I do not recommend hiking it unless you are an experienced hiker and are prepared for the strenuous, exposed climb to the top. 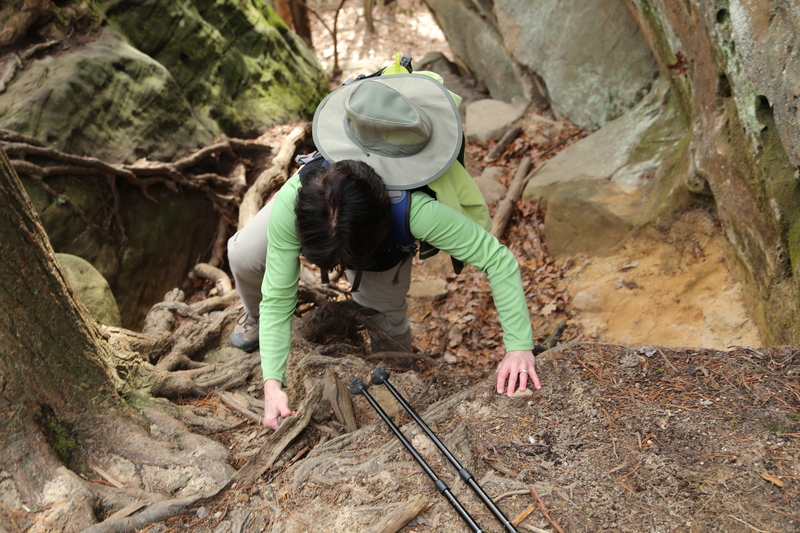 If you have any reservations at all about the climb up the exposed rock face of the staircase I suggest taking the alternate route to the top and even then you need to exercise great caution! 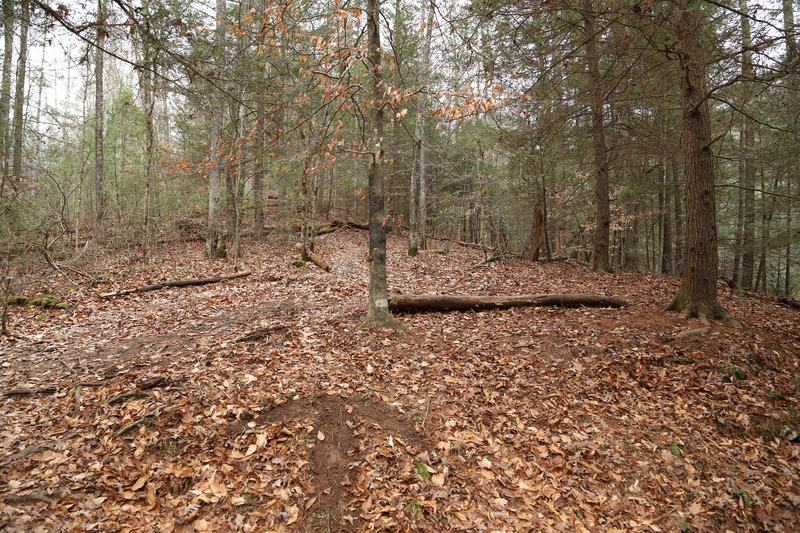 The area above the staircase has an extended area of exposed cliff line that is also very dangerous. Avoid venturing too close to the cliff edges and do not become another statistic by being foolish! Respect the real dangers that are present, pack out anything that you pack in, and please avoid adding your artistic flair to the rocks and trees in this beautiful and sensitive area! 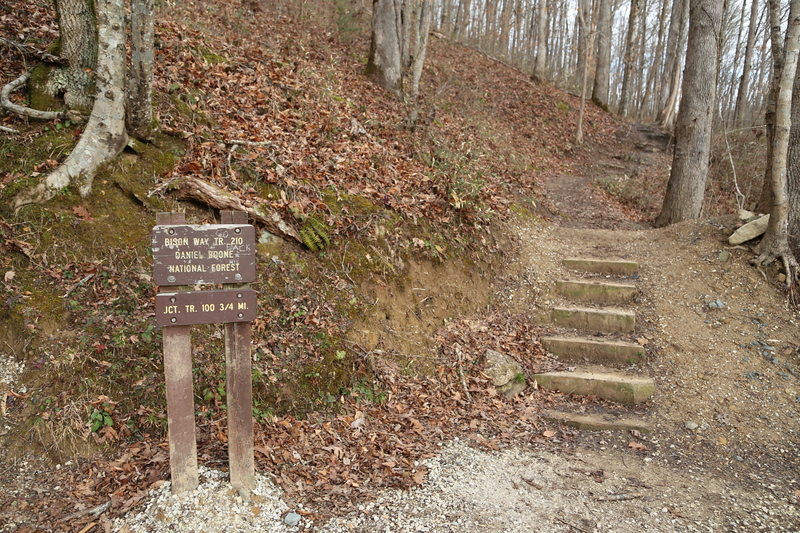 If you are new to the area, are an inexperienced hiker, or are hiking with children I highly recommend sticking to the marked trails. 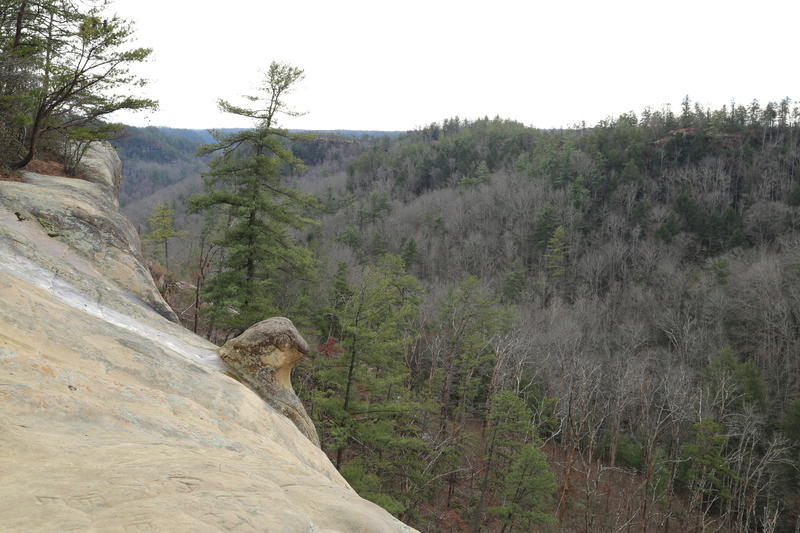 There are numerous official trails in the gorge that boast equally as incredible views. 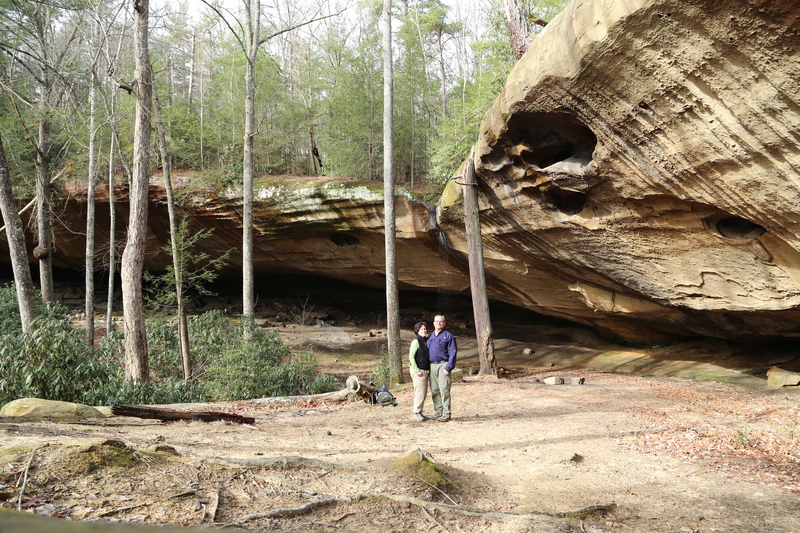 My “Kentucky’s Red River Gorge” page provides more information on the gorge and also highlights several of our favorite hikes on the official trails ranging from easy to difficult. Even on the easier trails you will encounter high cliffs with no guard rails, so no matter how experienced you are or what trail, official or unofficial, you are on, exercise extreme caution. Steep drop-offs are often unseen until you are right on top of them; and if you are hiking with children keep them close by your side at all times! 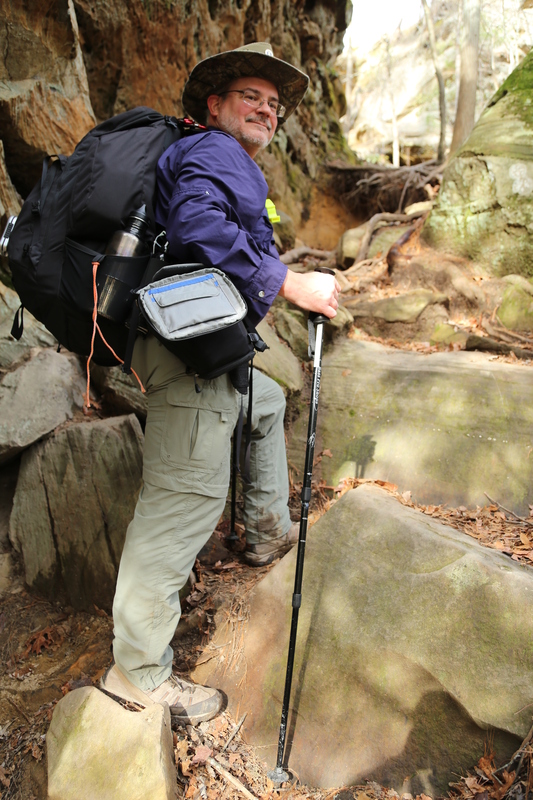 Good topographic maps are a must if you are venturing off the official, marked trails in the gorge. I am a big fan of the map set offered by OutrageGIS, though the 2009 edition I use does not cover the trails around Indian Staircase. I do not know if the 2013 edition has been updated to include this area. 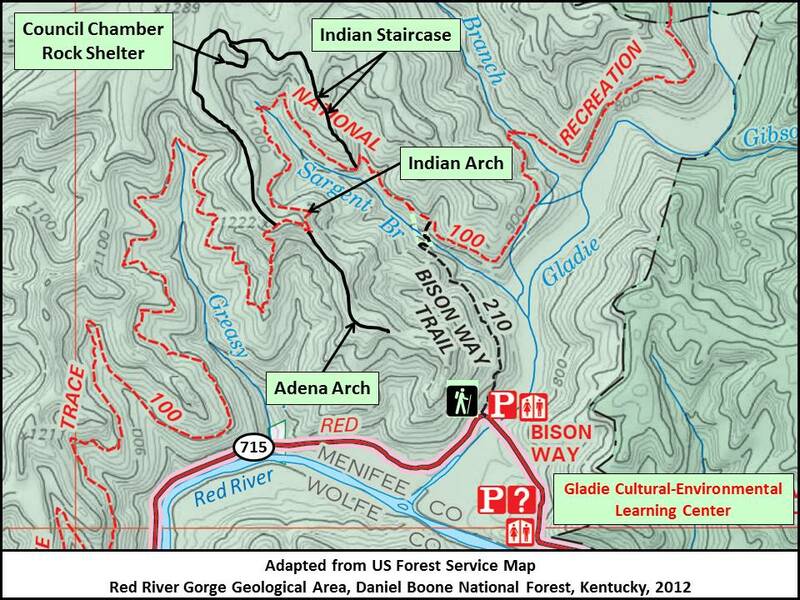 For this hike I relied on the US Forest Service’s 2012 topographic map of the gorge (note: this is a 20 MB .pdf file and can be a slow download). This is a good map, but it does not show any of the unofficial trails, though I have sketched in the relevant trails on the modified map section shown in Figure 1. 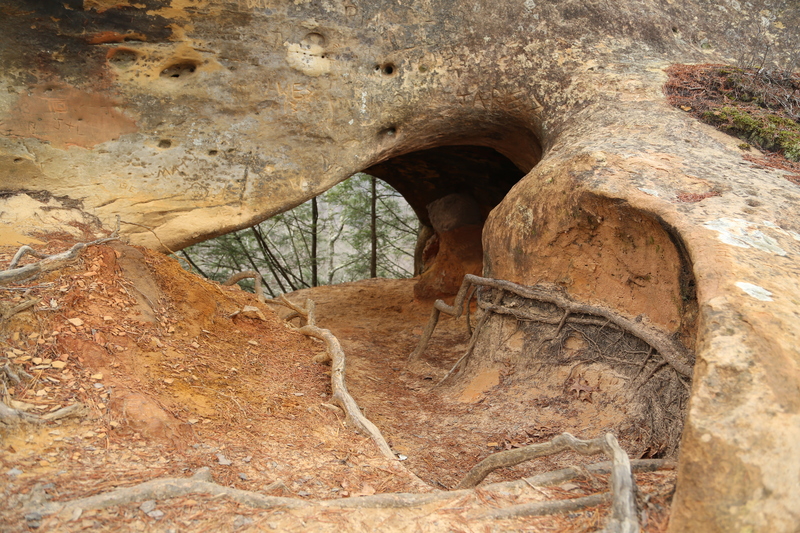 The best source of information for this hike was Jerrell Goodpaster’s book, “Hinterlands,” which describes over 100 unofficial trails in the gorge. Just came across this post and I use to hike there a lot when I was younger. Hope to back there in the future. We try to get down there as often as possible, still have a few miles of trails we’ve yet to explore. 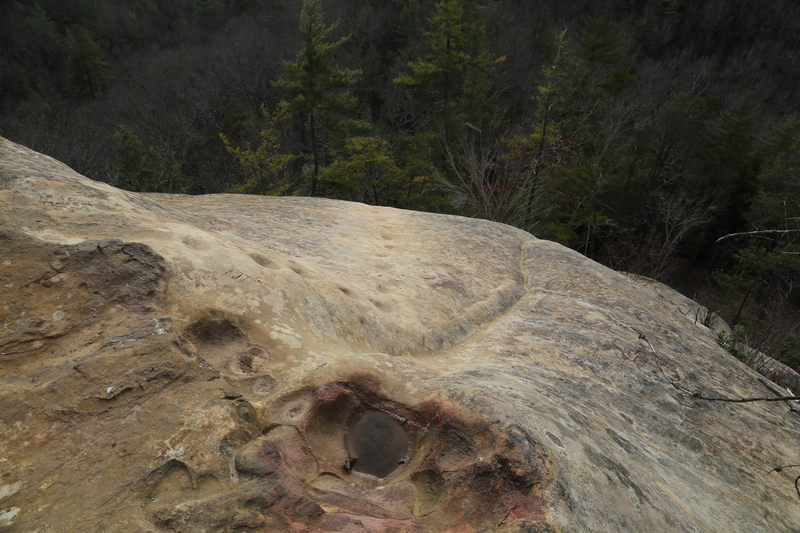 If you continue thru the Council Chamber rock shelter, a trail follows along the side of the cliff, below the ridge line, that eventually hooks back up with the trail at the top of ridge (before you get back to the Sheltowee trace). Really nice views along cliff looking back at the staircase. Thanks, Barry. I have been back since I originally wrote this and have hiked out past the Council Chamber. One of these days I need to update my page to include this part of the trail, as well.